Pep Guardiola has confirmed that Sergio Aguero could return from injury against Brighton in the FA Cup this weekend in a major boost for Man City. The 30-year-old has been in brilliant form so far this season, scoring 29 goals and providing eight assists in 38 appearances as he has spearheaded City’s pursuit of major honours. As they prepare to face Brighton, having their leading goalscorer and talisman will heavily tip the odds in their favour and so it could be a sensible move to back them to book their spot in the final while winning big yourself with this Ladbrokes promo code. He picked up a knock in the win over Fulham last week and missed the clash with Cardiff City on Wednesday night as a result. Fortunately for the defending Premier League champions, it isn’t a serious setback as Guardiola has revealed that Aguero is with the squad ahead of their FA Cup semi-final encounter on Saturday evening. “He is almost fit. He is travelling,” the Spaniard told the media, as noted by Sky Sports. On one hand, that would suggest that he may not risk using Aguero unless necessary, with Gabriel Jesus doing a good job of filling in for his teammate last time out. Particularly with key games coming up as they continue to target a quadruple this season, Aguero’s fitness could be decisive as they prepare to take on Tottenham three times in the space of 11 days. However, if Aguero is passed fit by the medical staff, he’ll be itching to get back on the pitch as soon as possible to regain his rhythm and sharpness, and so he could yet feature this weekend. It will be a blow for title rivals Liverpool though, as Aguero’s return certainly strengthens Man City’s hopes of retaining their crown this season, with the Merseyside giants hoping to go back top of the standings with a win over Southampton on Friday night. With Liverpool boasting such a fearsome attack in the form of Mohamed Salah, Sadio Mane and Roberto Firmino, City could really do with having Aguero back to boost their own front line and perhaps take them that little bit ahead of their title rivals. While Raheem Sterling, Leroy Sane and Bernardo Silva are also world class forward players, a 30-goal-a-season striker like Aguero is an essential ingredient for any side looking to win the biggest trophies. 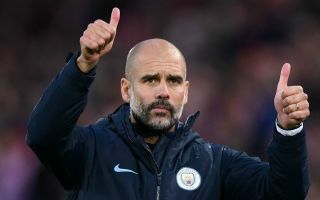 The Argentine has already helped fire City to three Premier League titles in his time at the Etihad Stadium, and he’s sure to have a key role in helping the club to a fourth.